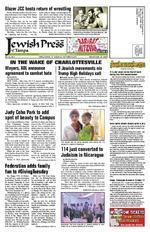 PAGE 10 JEWISH PRESS of TAMPA AUGUST 25 SEPTEMBER 7, 2017 WASHINGTON (JTA) In a rare statement unrelated to Israel or the Middle East, the American Israel Public Affairs Committee implicitly rebuked President Donald Trump for drawing an equivalence between the sides in the Charlottesville clash. AIPAC shares the outrage and deep concern of our fellow Americans about the inexcusable violence and sickening displays of racism and anti-Semitism in Charlottesville, the prominent Israel lobbying group said in a statement posted on Twitter. The vile hatred expressed by neo-Nazis, the KKK and white supremacists must be categorically and unambiguously rejected. We moral equivalence and oppose between those who promote hate and those who oppose it. There must be no quarter for bigotry in our country. AIPAC joins the virtual gamut of Jewish groups encompassing all religious streams that have issued similar statements. AIPAC rarely makes pronouncements on issues not related to Israel and almost never issues statements that at least do not tangentially relate to the Middle East.AFMDA cancels gala at Mar-a-Lago Club(JTA) Nine charities have canceled planned galas at President Donald Trumps Mar-a-Lago Club in Palm Beach, including the American Friends of Magen David Adom. AFMDA, the U.S. fundraising arm of the Israeli Red Cross organization, announced the in a statement provided to the Washington Post, citing the apolitical nature of the humantarian aid organization. Some of the groups cited Trumps response to the far-right rally in Charlottesville, VA, as the reason for canceling. In other cases, groups said the venue was detracting from the message of their events. The club makes $100,000 to $275,000 on such events, the Washington Post reported. NEW YORK (JTA) The AntiDefamation League received 10 times as much money as usual from online donations in response to the white supremacist rally in Charlottesville, VA. The group, which combats anti-Semitism and bigotry, reported a 1000 percent increase in online donations during the week beginning Aug. 13, one day after the Charlottesville rally. The ADL said it received six times as many individual donations as during an average week this year, mostly In the aftermath of the rally, skyrocket. It received $1 million donations from Apple and 21st Century Fox CEO James Murdoch. JP Morgan Chase also announced that it would donate $500,000 to the group. JP Morgan and Apple also pledged to match donations to the ADL and other nonprofits from employees In rare non-Israel statement, AIPAC rebukes Trump ADL:1000% surge in online donations IN THE WAKE OF CHARLOTTESVILLE SPONSORED BY MENORAH MANOR www.menorahmanor.org Toby Weinman Assisted Living Residence Irv Weissman Adult Day Center (727) 345-2775 The annual Founders Association dinner, which was held at the Marion and Bernard L. Samson Nursing Center on Wednesday, August 9th. Two new Founders were honored: The Menorah Manor Guild and RFLP Group the Linsky/Rosenblatt Family. In addition to a major nancial commitment, Founders are also committed to providing leadership and to taking an active role in future planning. The beautiful and delicious meal was prepared and served by Menorah Manors very talented Dining Services staff. Menorah Manor is proud to honor its new Founders Association members. Mazel tov and thank you for being such important partners in Menorah Manors mission of providing the best possible care in a warm, homelike, Jewish environment.Menorah Manor hosts annual dinner to honor new Founders Association members(L-R) Rob Goldstein, Menorah Manor CEO; Susie Berman, Menorah Manor Foundation Chair; Barbara Baughman, Menorah Manor Guild President; Jackie Kanner, Foundation Trustee and Co-Chair of the Samson Nursing Center Gift Shop; and Barry Kanner, Menorah Manor Chair. (L-R) Doris Rosenblatt, David Linsky, Frank Rosenblatt, and Nancy Linsky (L-R) Carl Glassberg and Judy Ludin, Menorah Manor Chief Development Ofcer (L-R) Marilyn Benjamin, Sally Siegel, Toby Nastir and Edie Seligman (L-R) Jane Silverberg, Mary Ann Marger and Terri Gross (L-R) Dr. Morrie LeVine, Dr. David LeVine and Marilyn LeVine (L-R) Sue Heyman, Mike White and Rabbi Leah Herz, Director of Spiritual Care at Menorah Manor. (L-R): Toby Nastir and Mel Myers. JEWISH PRESS of TAMPA PAGE 11 AUGUST 25 SEPTEMBER 7, 2017 MAYORSLos Angeles, Chicago, Houston, Philadelphia, Washington, D.C, Louisville and Phoenix. For decades, Americas mayors have taken a strong position in support of civil rights and in opposition to racism and discrimination of all kinds, the Mayors Compact reads. We are now seeing efforts in our states and at the highest levels of our government to weaken existing civil rights policies and reduce their enforcement. We have seen an increase in hate violence, xenophobic rhetoric, and discriminatory actions that target Muslims, Jews, and other minorities. The compact sets out a 10-point program that includes publicly condemning bigotry; ensuring public safety while protecting free speech; training and funding law enforcement to enforce hate crime laws; working with community leaders to combat bigotry; and strengthening anti-bias education programs in schools. Many of the points echo a plan of action that the ADL called on the White House to adopt shortly after the white supremacist rally in Charlottesville, VA, and President Donald Trumps response, which the ADL and many others have slammed. The events in Charlottesville once again showed us we have much work to do to bring Americans together, said Jonathan Greenblatt, the ADLs national director on a conference call with reporters. We know that hate is on the rise. ADL cant wait any longer for the president to act. ADL is ready to work with communities across the country to combat hate. Some of the mayors also portrayed the compact as a response in part to the presidents equivocation of white supremacists and those who oppose them. Steve Adler, the Jewish mayor of Austin, TX, who has volunteered for the ADL in the past, said during the call that mayors dont need a televiolence on many sides and for two days did not single out the white supremacists for censure. A day after he did so, the president among the far-right protesters and the counter-protesters. Responsibility for the violence that occurred in Charlottesville, including the death of Heather Heyer, does not lie with many sides but with one side: the Nazis, altright and white supremacists who brought their hate to a peaceful community, the statement said. Our tradition teaches us that humanity is fallible yet also capable of change. We pray that President Trump will recognize and remedy the grave error he has made in abetting the voices of hatred. Its not clear whether there would be a separate call for Orthodox rabbis, who have participated in the annual calls, which were routine with President Barack binical groups said no separate call was in the works. presidency and believe it is more effective to address questions and concerns directly with the White House, said Rabbi Mark Dratch, the executive vice president of the Orthodox movements Rabbinical Council of America. Presidents George W. Bush and Bill Clinton, but not necessarily formalized as a pre-High Holidays call. (JTA) Gary Cohn, a prominent Jewish member of President Donald Trumps administration, considered resigning over Trumps response to a far-right rally in Charlottesville, The New York Times reported. Cohn, the top economic adviser for Trump, drafted a letter of resignation, according to the report, which cited two unnamed people familiar with the draft. In an interview with the Financial Times, Cohn said the White House can and must do better in consistently condemning hate groups. His remarks came nearly two weeks after the Charlottesville rally, which turned deadly when an alleged white supremacist rammed a crowd of counter-protesters with a car, killing one and injuring at least 19. national dialogue about the violence. As a patriotic American, Cohn said he did not want to leave his job as director of the National Economic Council. But I also feel compelled to voice my distress over the events of the last two weeks, he said. After the Charlottesville rally, Trump said that both far-right marchers who gathered in the southern Virginia city and counter-protesters shared the blame for the violence that ensued. Trump later condemned the Ku Klux Klan, racists and neo-Nazis amid criticism that he failed to single out the far-rightists immediately afterward, but a day later said there were very Cohn was standing Trump in the lobby of Trump Tower in New York City on Aug. 15 when the president made his latter remarks to reporters. The called to announce a newproposal for infrastructure spending. Citizens standing up for equality and freedom can never be equated with white supremacists, neo-Nazis and the KKK, Cohn said in the Financial Times interview. I believe this administration can and must do better in consistently and unequivocally condemning these groups, and do everything we can to heal the deep divisions that exist in our communities. Cohn added: As a Jewish American, I will not allow neo-Nazis ranting Jews will not replace us to cause this Jew to leave his job. He also told the Financial Times he spoke privately with Trump about these issues. I have not been bashful saying what I think, Cohn said. In the days after Charlottesville, Cohns family including his wife told him he needed to think seriously about departing, The New York Times reported, citing two people briefed on the discussions. Several of his friends in the business community also urged him to step away from the administration. Amid fears that Cohn would resign, the U.S. stock market dropped until the White House denied the rumor. Cohn was deeply troubled by the market reaction, people close to him told The New York Times. His remarks were in marked contrast to a statement by the Treasury secretary, Steven Mnuchin, who also is Jewish, and stood directly behind the president during the Aug. 15 news conference. I dont believe the allegations against the president are accurate, and I believe that having highly talented men and women in the country surrounding the president in his administration should be reassuring to you and the American people, he told former Yale classmates who had urged him to resign.Trump adviser Gary Cohn reportedly considered quitting after CharlottesvillePhoto by Drew Angerer/Getty Images prompter to say Nazis are bad. Theres a clear lack of a moral compass, Mayor Shane Bemis of Gresham, OR, a city of 100,000 east of Portland, said on the call. This shouldnt be a surprise to anyone, how he has continued to divide us since the election. It is clearly, in my view, an absence of any sort of moral leadership from the president. But mayors were divided on a couple of contentious issues, including the removal of Confederate monuments from cities and how to strike a balance between protecting civil liberties while guarding against incitement and threats to public safety. Tom Cochran, CEO of the mayors conference, said policy on how to deal with Confederate memorials should be left up to individual cities. This discussion is not about monuments, he said. This conversation is about coming together to denigrate all acts of hate wherever they occur, and making sure we protect public safety while making sure that the right to free speech will always be protected. PAGE 14 JEWISH PRESS of TAMPA AUGUST 25 SEPTEMBER 7, 2017 Bnot Mitzvah A multi-media exploration of Jazz told from the fans perspective.This four-part series will explore the mystifying and daunting music known as Jazz, as we follow the career of Miles Davis.7:00 8:30 PM August 15 Miles Davis and his First Great QuintetSeptember 12 Miles Davis and Kind of Blue October 17 Miles Davis and his Second Great Quintet November 14 The Tampa JCCs Culture Caf Presents:A Beginner s Guide to Loving Jazz Craft Beer, Cheese & Jazz! Cost per session: $10 Members/$15 Non-membersHeld at the Bryan Glazer Family JCC522 N. Howard Avenue Tampa, FL 33606For more information, contact Pnina Levermore at 813.291.2253 or pnina.levermore@jewishtampa.com Right at Home offers caregiving services for almost any family and practically any situation. Naomi Leah Rappaport, daughter of Jody and Yoav Rappaport of Tampa, will be called to the Torah as a Bat Mitzvah on Saturday, Sept. 9 at Congregation Kol Ami in Tampa. An eighth grade honors student at Hillel Academy of Tampa, Naomi was invited to participate in the Duke University Talent IdentiNaomi is a member of the Tampa Titans volleyball team and enjoys all sports teams at her school. She is a member of Kadima and has been a camper at Camp Ramah Darom Jody and Yoav Rappaport will host a celebration at the Carroll wood Country Club on Saturday evening, Sept. 9. Special guests will include grandfather Dan Rappaport of Tel Aviv, grandparents Reva and grandmother Judith Gottlieb, cousins, Jay Azneer, Ira Azneer, Micah and Daniel Azneer, all of St. ins, Jessica, Sam, Toby and Dustin Dayna Marissa Schreiber, daughter and Adrian Schreiber of Tampa, will be called to the Torah as a Bat Mitzvah on Saturday, Sept. 9 at Congregation Schaarai Zedek in Tampa. An eighth grade Heads List stuis a member of the National Junior Honor Society. Active in sports, she plays on the middle schools varsity volleyball team and soccer team. She enjoys crew and has been a camper at Camp Coleman for the last six summers. For her mitzvah project Dayna was a volunteer at host a dinner and dance reception at the Centre Club on Saturday evening, Sept. 9. Special guests will include family and friends from various states including Kentucky, Georgia and Florida. Melinda Brooke Linsky, daughter of Stacie and Sam Linsky of Tampa, will be called to the Torah as a Bat Mitzvah on Saturday, Sept. 9 at Congregation Schaarai Zedek in Tampa. A seventh grade Deans List student at Berkeley volleyball team and was in the middle school play. She also enjoys being a camper at Camp Barney books for the Little Book Bus. Stacie and Sam Linsky will host a party at the Bryan Glazer Family JCC on Saturday, Sept. 9. Special guests will include grandparents Nancy and David Linsky, and Dr. Alan and Jo Marks, great-grandparents Doris and Frank Rosenblatt. Anna Ruby Hirschkowitz, daughter of Jeannette and Ret. Col. Steven Hirschkowitz of Tampa, will be called to the Torah as a Bat Mitzvah on Saturday, Sept. 2 at Congregation Rodeph Sholom in Tampa. An eighth grade honor student at Hillel Academy, Anna is an avid equestrian competing in Hunter Jumpshooting at the range and is an expert marksman. She enjoys drawing and all types of art, traveling, cruising and Broadway shows. For her mitzvah project, Anna Ruby Hirschkowitz Melinda Brooke Linsky Naomi Leah Rappaport Dayna Marissa Schreiber Anna collected donations for service in Brandon. Special guests will include grandparents Janet and James Elder, great-aunts Arlene Harris, Judy Sergesketter Dautch, Susan Futoran, Francine Hirschkowitz and Dautch and Jody Futoran. PAGE 16 JEWISH PRESS of TAMPA AUGUST 25 SEPTEMBER 7, 2017 Organizations JEWISH COMMUNITY CENTERS & FEDERATI ON Tampa rfn tb nrnn tttrnn rr f nb rrr rrfntb rfff fntb ffbf trnt trfbf rrff f f TO THE ARMORY ONE NIGHT ONLY TUES, SEPT 26, 2017 BELL TIME 7PM JWVMusical event: The Jewish War Veterans Post 373 will be entertained by the Carrollwood Cultural Center Chorus at the next meeting on Sunday, Sept. 17, at Congregation Beth Am, 2030 W. Fletcher Ave. The event begins with breakfast at 9:30 a.m., hosted by the Beth Am Mens Club. All are invited. The Post seeks members who would like to help ill and disabled veterans. Contact Commander Jack Rudowsky at (813) 598-8061 or email rochelletsr@gmail.com.JCCAll programs listed are either at the Maureen & Douglas Cohn Jewish Community Campus, 13009 Community Campus Drive, or at the Bryan Glazer Family JCC at 522 N. Howard Ave. To RSVP or for more information on programs at either center, contact Pnina Levermore at (813) 291-2253 or pnina.levermore@JewishTampa. com. All registrations should be completed before events begin. Bridge lessons: Those who want to learn how to play bridge or improve their game can take a session of bridge lessons from noon to 1:30 p.m. at the Glazer JCC on Fridays, Sept. 8 and 15 and Wednesdays, Sept. 20 and Oct. 11. The cost for classes is $50 for members and $60 for non-members. Biblical literature: This course, which meets at the Cohn campus every other Wednesday from 1:30 -2:30 p.m. beginning Sept. 13, provides an opportunity to see the Bible, not from a religious perspective, but as a piece of remarkable writing. This is a discussion course with open participation from people from all faiths and backgrounds. Each member is encouraged to bring his/her own Bible so participants can compare different translations. Cost is $3 for members and $4 for guests Book Club: The book club at the Cohn Campus will meet on Monday, Sept. 11 from 1:30 to 2:30 p.m. The discussion will be about A Man Called Ove by Fredrik Backman. There is no charge to attend. The other four questions: Rabbi Jason Rosenberg of Congregation Beth Am will lead classes to explain the background The classes begin, Thursday, Sept. 14 at noon at the Cohn campus. Additional classes will be held in October, March, April and May, with topics to be announced later. Museum tour: A docent-led tour of the Tampa Bay History Museum will be held for members of both JCCs on Wednesday, Sept. 6 from noon to 3 p.m. The tour is free for members and $8 for guests. RSVP is required. Yiddish nostalgia: Join Ruth Weston and other Yiddish enthusiasts on the fourth Thursday of the month from 12:45-1:45 p.m. at the Cohn Campus to share favorite expressions and reminisce. Medicare seminar: A program to help seniors develop strategies to reduce the fear of falling and increase activity levels will by offered at the Glazer JCC led by Judy London, a licensed healthcare agent and gerontologist, on Thursdays, Sept. 7 through Nov. 2 from 1-3 p.m. This is free for members and $15 for guests. Memoir writing: Learn to write your life story during classes on Mondays from Sept. 11 through Oct. 16 from 2 3:30 p.m. at the Glazer JCC. The cost is $50 for members and $65 for guests. Crochet lessons: Learn crochet with Judy Balber in a series of four classes on the Cohn campus on Mondays, Sept. 4 through Sept. 25 from 10:30 a.m. to noon. Bring yarn, crochet hooks and any pattern you want. Cost is $25 for members and $30 for non-members with prorating options available. Dominoes lessons: Learn the basics of the game of dominoes and hone your skills in free classes at the Cohn campus on Wednesdays from 11 a.m. to 12:30 p.m. Lessons at the Glazer JCC will be on Wednesdays, Sept. 6 through Oct. 25 from 11 a.m. to 12:20 p.m. Either class is free for members and $5 for guests. News schmooze: A discussion group, led by Pat Renfroe, which explores hot button issues, is held at both JCCs. Upcoming News Schmooze sessions at the Glazer JCC are Tuesdays from 7-8:30 p.m. The group at the Cohn campus, meets the second and fourth Friday from 10:30 a.m. to noon. The group will talk about the EPA and Homeland Security on Sept. 8. There is no charge to attend. Mah jongg: Folks can play at both JCCs. At the Cohn campus there will be sessions every Tuesday and Thursday from 1:30 3:30 p.m. At the Glazer JCC, drop-in sessions are offered on Mondays, Tuesdays and Thursdays from 1:30 3:30 p.m. This is free for members and $5 for non-members. Novices and experienced players are welcome. There are also classes on Sundays from Sept. 17 through Oct. 8 from 9:30 to 11:30 a.m. at a cost of $65 for members and $70 for guests, with advanced registration required. Ballroom dancing: Learn graceful, elegant and romantic dances during ballroom dancing sessions at the Glazer JCC on Mondays, Sept. 11 through Dec. 18 from 5-6 p.m. The cost is $35 for single members, $50 for couple members, $40 for single nonmembers and $55 for couples who are non-members. All that jazz: Enjoy craft beer, cheese and music at Culture Caf: A Beginners Guide to Loving Jazz a multi-media exploration of the musical genre. The focus will be on Miles Davis career. month, but the remaining sessions are from 7-8:30 p.m. Tuesdays, Sept. 12, Miles Davis and Kind of Blue; Oct. 17, Miles Davis and his Second Great Quintet; and Nov. 14, Miles Davis Goes Electric. Cost per session is $10 for members and $15 for non-members.HadassahAnnual meeting: The North Pinellas Chapter of Hadassah will hold its annual member appreciation luncheon on Monday, Sept. 11 at 11:30 a.m. at Temple Ahavat Shalom, 1575 Curlew Road, Palm Harbor. This is open for all life and annual paid-up members, associates and prospective members. Cost is $5, collected at the door. Reservations are required. To RSVP, call Doris Harding at (727) 772-4140.Genealogical SocietyHolocaust data resources: The next meeting of the Jewish Genealogical Society of Tampa Bay will be hosted by and held at the Florida Holocaust Museum, 55 Fifth St. S., St. Petersburg, on Sunday, Sept. 10. Registration is at 1:30 p.m. and the program starts at 2 p.m. Urszula Szczepinska, curator of education and director of research at the museum, will discuss online resources that have the most updated information and demonstrate how to use archival databases for information about victims of the Holocaust. An optional docent-led tour of the museum, free for museum and society members and $9 for nonmembers, will take place following the program. Advanced registration for the tour is requested. RSVP to Sally Israel, (727) 343-1652.Job-LinksCareer counseling: Tampa Bay Job-Links offers free motivational Monday Morning Links sessions from 9:30 11 a.m. at the Jack Roth Center for Career Development at TampaBay-Job-Links, 4100 W. Kennedy Blvd., Suite 206, Tampa. On Monday, Sept. 11, the topic is Dos and donts from a recruiter perspective. Monday Morning Links is supported by the Vinik Family Foundation. There are also Success workshops to aid with job-search skills On Thursday, Sept. 7 from 9:30 a.m. to 1 p.m. the program is 5 steps to successfully negotiate a job offer. The program is free for JobLinks program participants; $15 for guests. A special four-part series, Switching Gears: A Roadmap for Career Transition will conclude on Sept.13 from 6:30 to 8:30 p.m. Cost is $15 per session; free for full-program participants. Reservations required for all programs. To RSVP, call (813) 3440200, email RSVP@TBJL.org, or visit www.TBJL.org. PAGE 2B AUGUST 25, 2017 Celebrate by booking your special event at Holiday Inn St. Petersburg North Clearwater. We are located minutes from top wedding and event venues, as well as the gulf beaches. Complimentary 24-hour shuttle service is offered within 5 miles, to/from St. Pete-Clearwater International Airport, and to/from Tampa International Airport. Our venue also offers a full bar, plated or buffet dining options, plus table linens and audio/visual equipment rentals. Special group accommodations rates for you and your guests are also available. PAGE 6B AUGUST 25, 2017 Included for every Bar or Bat Mitzvah: ( ) Magician DAVID FLETCHER DAVID FLETCHER Phone ( 727 ) ( 718 ) 885-3038 Ready... ...Go! By JORDANA HORN Kveller via JTAWhen my oldest son became a Bar Mitzvah, we had a congregational kiddush luncheon in his honor, and a small party for him and his friends that evening. Instead of having the grand blowout party that seems to be the general expectation in my New Jersey suburb, we opted to go to Israel instead. It was the best decision I possibly could have made for these reasons (among others): 1. Visiting Israel is not just any trip. Sure, we could have gone to Paris or Punta Cana, or to see penguins in Antarctica, for that matter. But the trip to see the Jewish state is a special one, and one I wanted to save as a special one to honor my son becoming a Bar Mitzvah. The implicit message I wanted to send my son was this: You have just pledged yourself as a full member of the people of Israel. We happen to live in an era of history in which Jews not only live in, but also govern, Israel. You, my son, are part of this history. The lives of the people who live here are inextricably intertwined with yours; the history that happened here is your history. Lets go see your world. 2. You get to focus on the mitzvah rather than the bar. When you take your kid to Israel, you dont have to stress about the alcohol per head at your event. Instead, you get to think about the good deed you are doing by taking your child somewhere truly important and showing your kid that the world is bigger than the small sphere carved out for them at middle school. When your child attends a school where there are many lavish parties, the bar continues to be raised as to the parties. Worrying about the party takes an inordinate amount of the time, effort and money when planning for a child to become a bar or bat mitzvah. I was very grateful to take that worry out of the equation. 3. The math works in your favor. For the complete cost of a lavish four-hour, 200-plus person party, you can have a weeklong vacation in one of the most fascinating places in the world. The photos you will take on your iPhone of your family in front of the Western Wall will be more precious to you than the professionally taken photos of your guests with cocktails in hand. The stronger sense of self and history that comes from this trip is, of course, priceless. 4. Israel is delicious. cannot equal the pleasure of Israels food. Whether you want to try kosher gourmet street food at Crave in Jerusalem (tell them I sent you), incredible gelato at Anitas in Tel Aviv or savory falafel with hummus and tahini basically anywhere, you will be happy and full. 5. More time equals more memories. While I am sure we would have wonderful memories of my son and extended family and friends at a blowout party, I will say I am profoundly grateful to have made the decision I made to go to Israel instead. While in Israel, we did everything from sample a Hanukkah sufganiya (doughnut) per day (at least!) to arguing about the out.) and about the Israeli Declaration of Independence in the hall where it was signed. The memories forged in Israel are profound. 6. Israel is family. In going to Israel with my children, I wanted to set the scene that Israel is more than a backdrop for a one-off family trip it is a place where I hope they will return, with me and other family members and friends, to learn, to travel and to grow. I took a picture of them in front of the Western Wall and told them, Every time you come here, you stand right here and take a picture of yourself, so that you will see how the stones dont change and how you do. And when they take those pictures, they will be able to frame them next to the pictures of their own mother standing in the same spot as a 13-year-old, as a 16-year-old, etc. And last, and certainly least: 7. Nobody will miss your party. Look, I am a huge proponent of celebrating simchas. But not a single person has said to me, You know, I feel bad you decided to go to Israel instead of having a party. I really missed the opportunity to look at you in an expensive dress and shout over a DJ as I eat elaborate hors doeuvres while drinking themed cocktails. And I didnt miss it either. While I love celebrating with my friends at their parties, I have to say that I felt relieved to not have had to think or worry about my own. The weeks go by and my son goes to several parties like this a month. I am not sure he will really be able to distinguish one from another when all is said and done. At the end of the day, I dont want to impress my friends and neighbors I want to impress upon my son what it means to be part of the Jewish people. And for that goal, this trip was a great success. Kveller is a thriving community of women and parents who convene online to share, celebrate and commiserate their experiences of raising kids through a Jewish lens. Visit Kveller.com. This story is reprinted by permission of Kveller.com. The original can be found at http://www.kveller.com/why-we-went-toisrael-for-my-sons-bar-mitzvah-instead-of-having-abig-party/Photo by Yonatan Sindel/Flash 90A bar mitzvah at the Western Wall in Jerusalem.Why we went to Israel for my sons Bar Mitzvah instead of having big partyGet your Bar/Bat Mitzvah noticed in the Jewish PressAs the time nears for your childs Bar/Bat Mitzvah, you will want to let the community know by announcing it in the Jewish Press. presstampa.com or www.jewishpresspinellas.com. To have a form sent to you, contact the Jewish Press at jewishpressinfo@aol.com or call (727) 535-4400. Black and white or color photographs are acceptable (no color copies or digital prints). The photo may mailed or e-mailed to jewishpress@aol.com as a JPG or TIF. Photos should be clear headshots and if emailed must be high resolution. There is a $5 charge to cover the cost of reproducing the photo. The completed form should be sent approximately a month in advance. The Jewish Press prints the announcement one to two weeks before the celebration, if possible. All information is published at the discretion of the Jewish Press. Mail to the Jewish Press, PO Box 6970, Clearwater, FL 33758 or email jewishpressinfo@aol.com. PAGE 10B AUGUST 25, 2017 For information, call Lauree Carnes at 813.207.6635, email Lauree.Carnes@hyatt.com or visit grandhyatttampabay.com. Hyatt. Youre More Than Welcome. In a move that countered tradition, the Halprins decided to use electronic invitations, or e-vites, for the Bnai Mitzvah of cousins Rehna Halprin and Abrianna Lalle. The virtual invitations saved the families hundreds of dollars on paper invitations, the hassle of tracking down the addresses of more than 200 guests and allowed guests to respond in a matter of moments. The e-vites also allowed much more customizing, according to the Halprins. You could add pictures and change the colors depending on what the girls wanted and who was receiving the invitation, explained Rehnas dad, Mike. Once the responses were received, it made it easy to send reminders, directions Shabbat eve dinner and Sunday brunch.An invitation to changeNothing not even a 230mile, four-hour car ride could keep cousins and best friends, Rehna Halprin and Abrianna Lalle, apart for their Bat Mitzvah. The girls basically decided that they were going to do this together and share it, and then they left the adults to handle the logistics, said Abriannas mom, Debbie Halprin. Debbie and her two girls live in Weston, although her roots are in St. Petersburg where Rehna and her parents, Natalya and Mike Halprin, still reside. The girls dreamed up plans via frequent text messages, FaceTime calls and during summers at Camp Shalom near Ocala. It was actually nothing new for the families. Almost 40 years ago, Michael and Debbie fondly recall their sisters shared her Bat Mitzvah with a cousin. It also made sense for their large shared family members to come for one big cele bration instead of asking them especially the out-of-towners to make the trip to Florida twice in a matter of months. But while it sounded like a great idea, there were complications, particularly when it came to discrepancies in the girls Hebrew training. Rehna had been attending Hebrew school regularly in preparation for her bat mitzvah, but Abrianna, who was used to attending a Chabad center in South Florida, had little to no Hebrew training. In the months leading up to the big day, Abrianna worked diligently to teach her self Hebrew. With very little outside help, she used some online resources to help her perfect her pronunciation. When it came time for the ceremony at Temple Beth-El in St. Petersburg, both girls performed admirably, mom Debbie said. On the big day, friends and family members gathered to support the cousins, including a very special guest, Rehnas grandmother from Russia. Unfortunately, Rehnas grandfather from Russia declined to attend, not fully understanding the sigsion he later regretted upon seeing photos of the ceremony and party, according to the family. As a tribute to mom Natalyas Russian heritage and her family visiting from Russia, Rabbi Michael Torop incorporated a prayer in Russian into the service. It was a lovely thing for the rabbi to do this for us, Debbie said. Following the formal Bnai Mitzvah service on Shabbat morning, attended by close friends and family members, there was a luncheon in the temple social hall. Later that night, 200 guests attended the Bnai Mitzvah celebration at a rented mansion in Tampa JAMIE SHAPIRO Grandmothers share joy at the Bnai Mitzvah of Rehna Halprin, second from left, and Abrianna Lalle. Far left, Rehnas grandmother who came from Russia for the occasion, Zoya Tatarkina, and far right, Bette Schroeder, bubbe to both girls.Cousins bridge distance divide to celebrate together By JAMIE SHAPIRO Jewish PressOn a sweltering September Saturday dur ing Labor Day weekend 2016, two cousins Rehna Halprin and Abrianna Lalle shared their Bat Mitzvah, celebrating afterward ter. While the girls shared the big day, for the most part, the planning was not. Since Abrianna and mom Debbie Halprin live 230 miles south in Weston, and the service was at Temple Beth-El in St. Petersburg, and the party was at a rented mansion in Tampa, Rehnas parents, Natalya and Mike Halprin, were responsible for getting all together. I was actively planning the party for only about two months before, Natalya said. But we had been brainstorming for well over a year. Originally from Russia and wanting to incorporate her heritage into the big event, Natalya won the girls OK for a Russian winter wonderland theme. Shopping for the September event began as far back as nine months before the Bnot Mitzvah. I would just go to the stores during the Christmas season and buy anything that This advanced shopping proved to come in handy when the hired decorators discovered it much harder to acquire the winter dcor during the summer than they antici pated. To create the wintery scene, Natalya put up Christmas trees, big and small, laced with decorative icicles and lights. Giant, icebergs shaped from Styrofoam were left added periodically for effect. Natalya also commis sioned an ice bar for the event, dispensing shots of vodka to the of-age guests. What could be more Russian than an ice bar and vodka? Natalya joked. A selection of caviar added more Russian To keep both adults and children enter tained, Natalya came up with the idea to separate the two groups; having a kids party on the and a more laid back adult party on the back patio. We basically had two different parties in the same place, said Mike. The two groups did come together briefly for the cousins unique and non-traditional candle lighting. For the candle light ing the Halprins handed out 200 electronic candles to guests. The candles were cool because they turn on when they come in contact with water, Mike said. With their 200 guests gathered around the mansions patio, Rehna and Abrianna thanked everyone in attendance before each guest threw their water-activated candle into the pool. It was incredible, Mike said. All those Party proves COOL idea candles lighting up at once. Im really proud of how the party came together, Natalya said. While both the Halprins will admit that planning a bat mitzvah for not one, but two, teenage girls had its stressful moments, both agreed all the planning was worth it and created memories for the two cousins that will last a lifetime. (L-R) Abrianna Lalle, her cousin Rehna Halprin and Rehnas sister Elizabeth are shown in front of their sign-in board. In the background are some of the Russian-inspired winter wonderland decorations. Mitzvahs unique candle lighting. In keeping with the Russian connection to the party, vodka was dispensed from an ice sculpture. The girls friends danced the night away in their own nightclub. PAGE 11B AUGUST 25, 2017 Your ONE STOP for: Centerpieces, Party Favors and Dessert Table!Looking for SPECIAL centerpieces?take a look at what we offer in customized Judaica themes! Keep the tradition going or create your own. Looking for Party Favors that your guests will remember for years to come? Nothing could be sweeter than these customized cookies! Centerpieces, Party Favors centerpieces? Keep the tradition going or create your own. Looking for Party Favors that your guests Call TODAY at 813.418.6418 to discuss your customized party needs! Hours: Monday-Friday 9:00AM-5:00PM & Saturday 10:00AM-2:00PM Nothing could be sweeter than these Looking for Party Favors that your guests Nothing could be sweeter than these to discuss your customized party needs! will remember for years to come? Nothing could be sweeter than these will remember for years to come? Nothing could be sweeter than these Cookies by Design...is all about making your event memorable! 2201 Feather Sound Dr. Clearwater, FL 33762 727.498.0005 Francine Burruezo www.FeatherSoundCC. events@feathersoundcc.com I have been part of the Jewish community and medical community for 29 years and hands down second to none Feather Sound Country Club is where you would want to have an Event Of A Life Time. The food the atmosphere and the ambience are outstanding. Dr. Heidi GoldbergYour child deserves the VERY BE ST! I was a professional singer for weddings and Bar/ Bat Mitzvahs at every top catering hall and hotel in New York City for many years. As a guest at many affairs at Feather Sound Country Club, I have been amazed at the beauty of the facility, the wonderful service and outstanding quality of the food. Florence Goldberg FEATHER SOUND COUNTRY CLUB By MENACHEM POSNER Chabad.org/news There was barely a dry eye in the room. Standing in the sanctuary before a close-knit group of friends and family who had come from all over the country, Heather Wilde carefully lit a single Shabbat candle and said the appropriate Hebrew blessing. Uncovering her eyes, she smiled at those around her and said, Good Shabbos! A student at the Chabad Hebrew School of the Arts in Peabody, MA, it was only natural that the 12-year-old would celebrate her Bat Mitzvah in a way that was meaningful and personal. The question was just how. Heather is a very sweet and positive young woman, said Raizel Schusterman, who co-directs Chabad of Peabody Jewish Center in the northern Boston suburbs with her husband, Rabbi Nechemia Schusterman. She also has Down Syndrome, which means that she has not been able to master Hebrew reading or deliver a long speech, but I tell the parents of our students all students, regardless of their abilities that this is a ceremony that has to be appropriate for the young person. Working together with Heathers mother, Brenda Wilde, she set a goal for the young girl: to memorize and recite the Shema, and to light a candle and say the accompanying blessing. Months of regular learning sessions paid off when Heather proudly did just that, late on the afternoon of Friday, June 23. With his guitar balanced on one robed knee, the rabbi, already dressed in his Shabof Heathers favorite songs from Hebrew school: Oseh Shalom and Alef Bet.Heather Wilde celebrated her Bat Mitzvah at Chabad of Peabody Jewish Center in the northern Boston suburbs. Here, she is with Raizel Schusterman, co-director of the center with her husband, Rabbi Nechemia Schusterman.A beautiful Bat Mitzvah for a girl with Down Syndrome Heather Wilde, who has Down Syndrome, covers her eyes for the blessing over the Shabbat candle. Exceeded Our Expectations As Shabbat drew near, the women and girls who were present lit candles that had been artfully arrange to spell out Shabbat. Evening services were followed by a fullcourse dinner. The next day, at the Kiddush reception that followed morning services, the Bat mitzvah Girl recited the Hamotzi blessing over the bread. Heather was very pleased with herself, said Wilde. When she was practicing, I was worried like any mother. But she exceeded our expectations, and I found that as satisfying as when her brother had his Bar Mitzvah three years ago. It was a beautiful ceremony, said Raizel Schusterman, who hopes that Heathers Bat Mitzvah will encourage other families to think creatively about this milestone for their children with special needs. Like Heather herself, it was sweet, intimate, loving and full of joy. This story originally appeared on the Chabad.org website and is reprinted with permission of Chabad. org.